The borders of Italy were created for the first time by Roman emperor Augustus, when he established the roman province of ''Italia''. 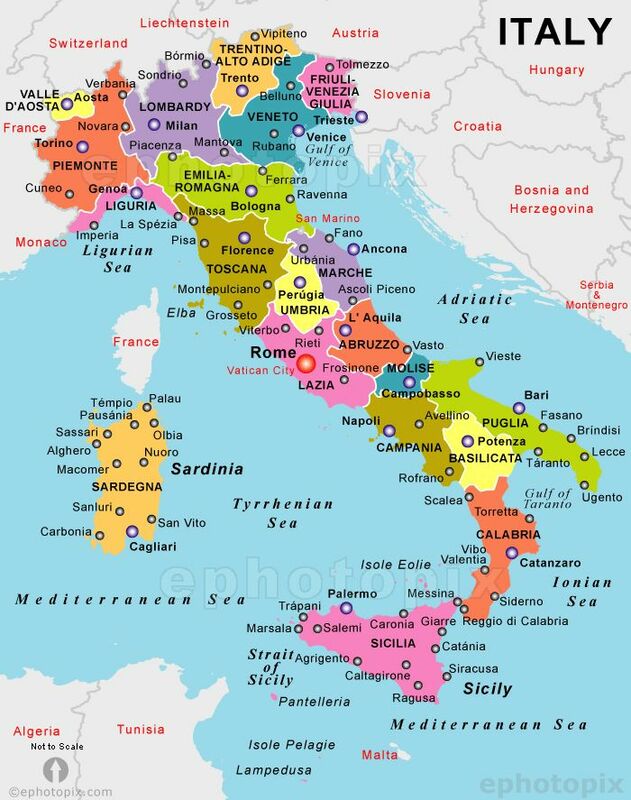 The unification of this "Italia Romana" started when Cisalpine Gaul, which had received Roman citizenship in stages, was incorporated into Italy in 42 BC: since then the Alps are the northern border of Italy. (1) Latium and Campania, including the Volsci, Hernici, Aurunci, and Picentini, from the mouth of the Tiber to that of the Silarus (Sele) River, (2) Apulia and Calabria, including the Hirpini (the “heel” of Italy), (3) Lucania and Bruttium, bounded on the west coast by the Silarus, on the east by the Bradanus (Bradano) River (the “toe” of Italy), (4) Samnium, including the Samnites, Frentani, Marrucini, Marsi, Paeligni, Aequiculi, Vestini, and Sabini, bounded on the south by the Tifernus (Biferno), on the north probably by the Matrinus (Piomba) River, (5) Picenum, between the Aesis (Esino) and Matrinus rivers, (6) Umbria, including the ager Gallicus, bounded by the upper Tiber, Crustumius (Conca), and Aesis rivers, (7) Etruria, bounded by the Macra (Magra) and Tiber rivers, (8) Gallia Cispadana, limited by the Po River, from Placentia (Piacenza) to its mouth, and by the Crustumius, which was substituted for the Rubicon, (9) Liguria, bounded by the Varus (Var), Po, and Macra, (10) Venetia and Istria, including the Cenomani around Lake Garda in the west, and (11) Gallia Transpadana, bounded by the Alps, the Po River, and the Addua (Adda) River. Under Augustus, the peoples of today's Aosta Valley and of the western and northern Alps were united to "Italia romana" (so the western border of Roman Italy was moved to the river Varus near Nizza), while the Italian eastern border was brought to the river Arsia in Istria near Fiume. The city of Emona (modern Lubiana in Slovenia) was the easternmost town of roman Italy, while Bolzano was the northernmost. This arrangement was retained almost unchanged until the emperor Diocletian’s reorganization in 293 AD, when the "Diocese of Italy" included the islands of Sicily, Corsica, and Sardinia. Successively, in the early fourth century, Italy came to include not only the islands of Corsica, Sardinia and Sicilia, but also areas of Raetia (Switzerland & Austria) to the north until the Danube river. 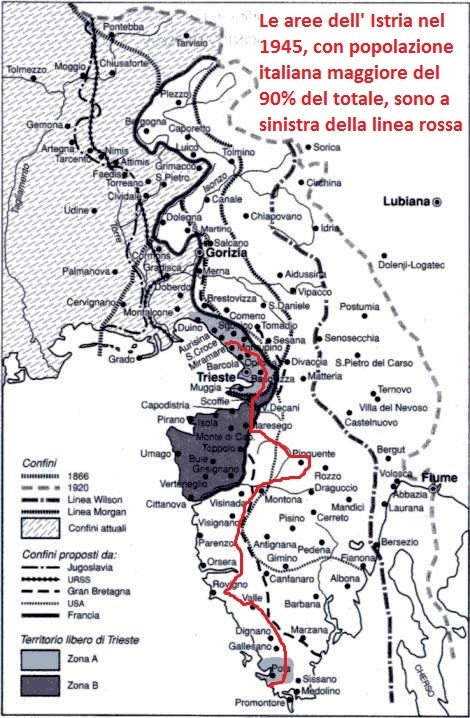 But this enlargement was only administrative (in the so called "Italia Annonaria") , because the Alps always remained politically the northern limit of roman Italy (see http://notitiadignitatum.org/613-map.htm). 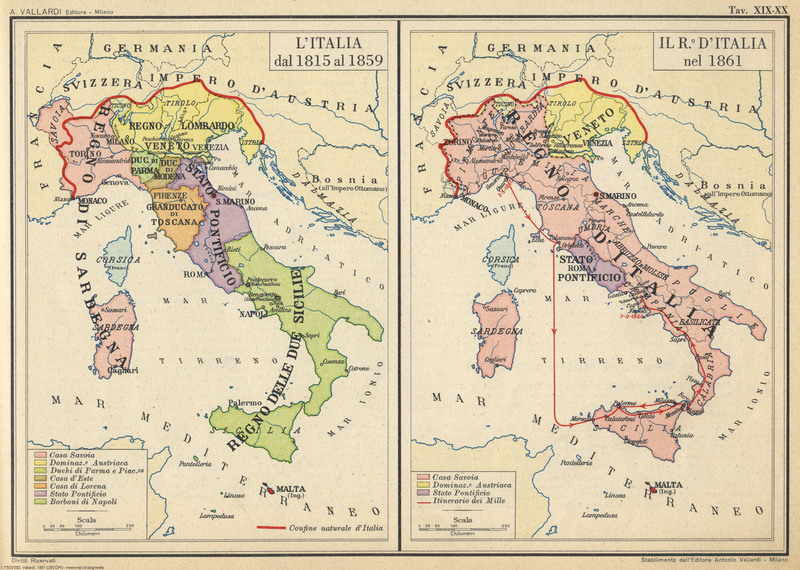 After the Longobard invasion in the eight century, Italy started to be divided until the Risorgimento in 1861, as can be seen in the above maps. Under Augustus Italy had a population of nearly 5 million inhabitants with Rome as the first and only city in the world to have one million citizens. But when Longobards settled in Italy after the massacres of the war between Gots and Byzantines, in what remained of "Italia romana" there were less than one million people and Rome was reduced to a small village of 5000 inhabitants only full of glorious ruins. 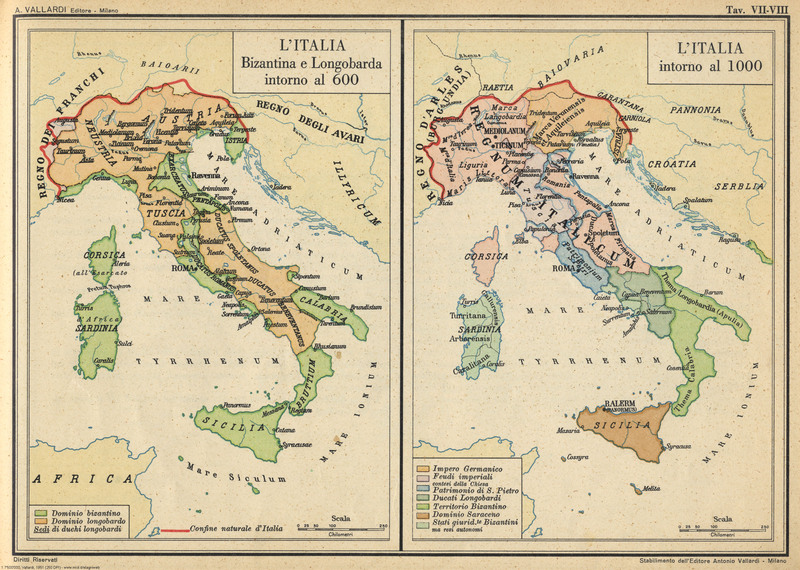 As a consequence in the depopulated former "Italia romana" started a process of arrival of other people mainly to the borders of Italy and successively -initially after the year 1000 AD but mostly after the Renaissance- a process of conquest/assimilation of border areas of Italy by other countries. 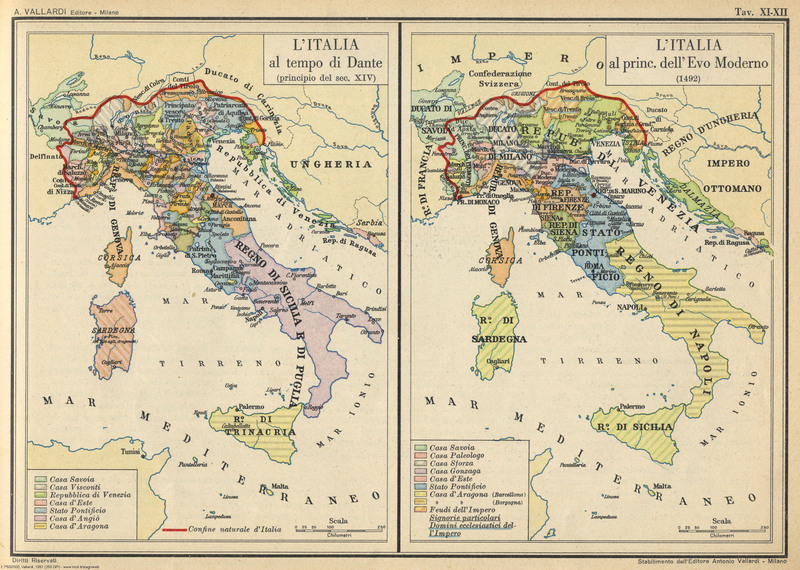 The reaction to these processes originated the "Italian irredentism". 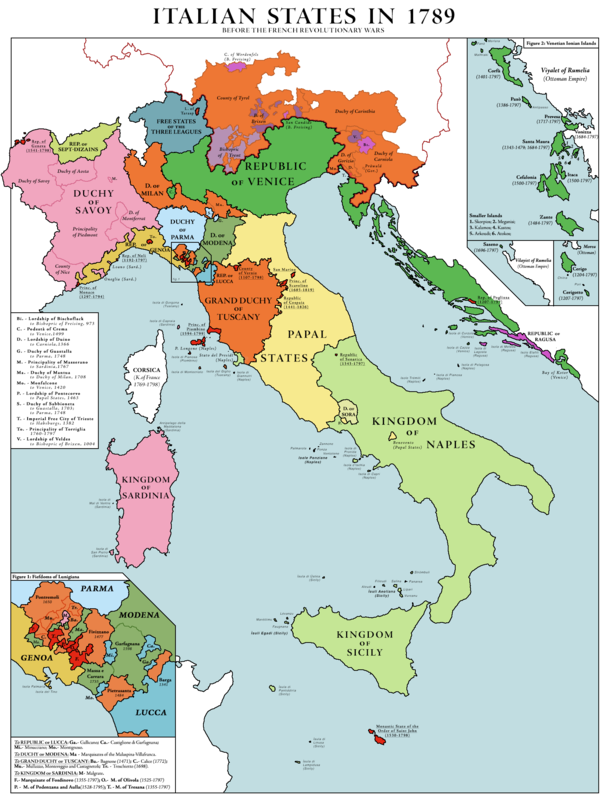 So, as can be seen in the map to the left, in the "Settecento" (XVIII century) and before the arrival in 1798 of Napoleon and his ideals of "nationality" based on common language and ethnicity, Italy was mainly in the hands of Spanish rulers (southern Italy) and Austrian rulers (Duchy of Milan, Tuscany, County of Tyrol, etc..) while only the Republic of Venice and the Papal States were fully independent. Tuscany -for example- was nominally a state of the German/Austrian "Holy Roman Empire" until the Treaty of Campo Formio in 1797. Additionally, the dominions of Venice were stretched along the Adriatic sea reaching the Dalmatian shores and the Ionian islands; Malta was nominally under the Kingdom of Sicily, but was ruled by the French controlled "Knights of Malta Hospitallers"; and the Kingdom of Sardinia was linked to France, but only in a limited way. 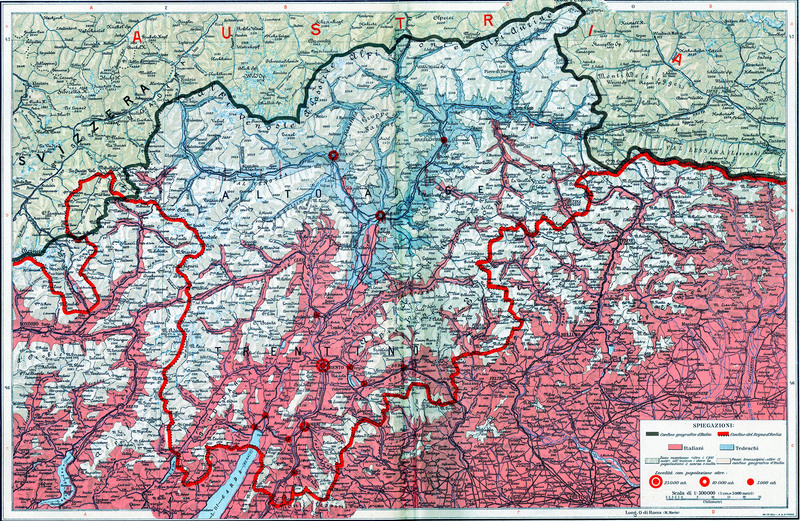 It is noteworthy to pinpoint that, in the following enlarged version of the same map, it is possible to see that there were areas of Alto adige with a majority of Italians/Ladins (in red) that now have disappeared, like around Salorno, Merano and near Switzerland (for example, in Val Venosta -near the Switzerland border- until the 1820s was only spoken the "Romansh language"). Additionally, I have explained in detail the ethnic problems -related to the Alpine penetration of Germans, French & Slavs populations inside the northern borders of Italy- in my former issue of August 2016 (http://researchomnia.blogspot.com/2016/08/etnography-of-northern-italy-regions-of.html ). It is noteworthy that the "Slavisation" of Venezia Giulia (and Dalmatia) was different from the one that happened in Alto Adige. The main reason was that during the barbarian invasions the area remained in Byzantine control (mainly Dalmatia & Istria): the presence of the Eastern Roman empire was fundamental in the survival of the neolatin populations in the eastern borders of northern Italy. So, some autochthonous inhabitants continued to live there, and did not happen the nearly full depopulation that there was in Alto Adige (and further north, in what is actual Austria). 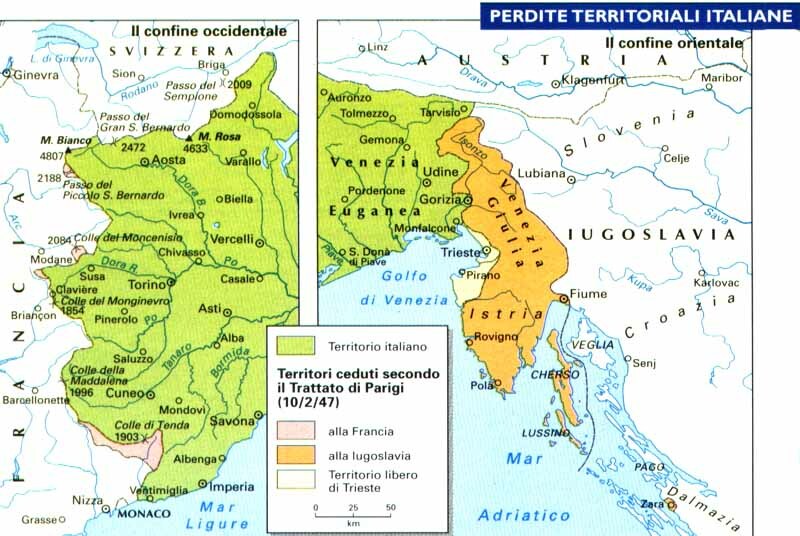 However -inside the natural borders of Italy defined by the "hydrographical" division in the Alps- there was some penetration of Slavs in "Venezia Giulia", but it was stopped -according to the famous "Placito del Risano"- in 804 AD. However the areas around Postumia & Idria were "assimilated" by Slovene populations, mainly during the Renaissance centuries, even if small communities of Ladins still lived there until Napoleon times. 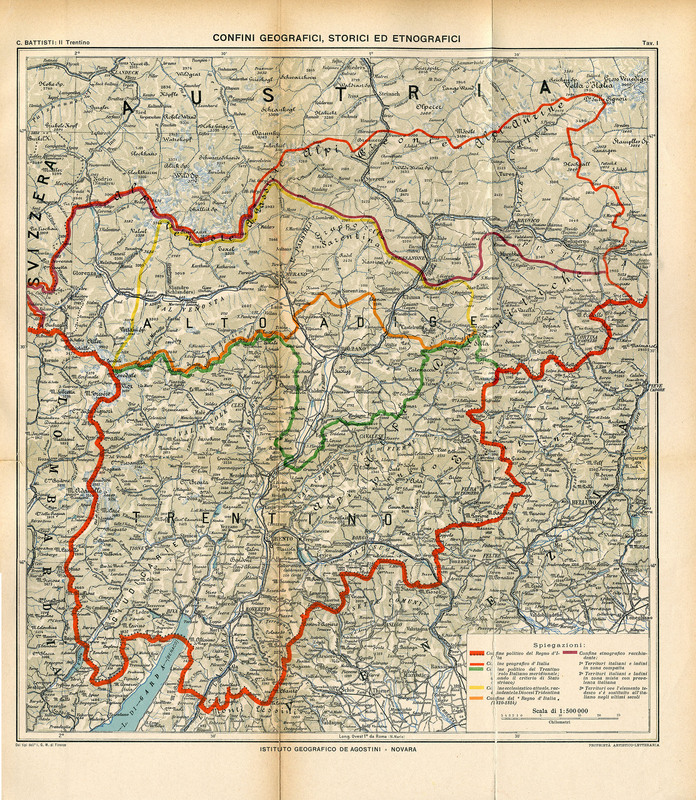 After WW1 Italy's borders included the Venezia Giulia mountains and Fascism favored the immigration of Italians in the area of upper Isonzo & Postumia/Idria, creating (or better: recreating) a minority of Italians in an area that has been mostly Slovenian populated for the last centuries. 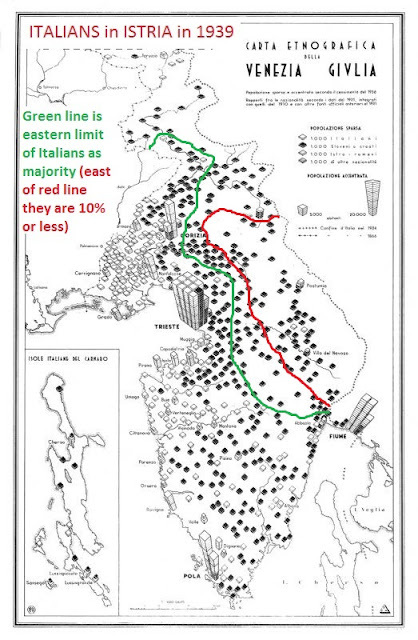 Only the area of monte Nevoso just north of Fiume (see map on the left) was practically without Italians in 1940. The area of venetian Dalmatia (with the "Repubblica di Ragusa") was initially included in the Kingdom of Italy by Napoleon, but only after WW1 inside the borders of Italy were united the northern Dalmatian islands of Cherso & Lussino with the small enclave of Zara & the southern Dalmatian island of Lagosta (and also the little Albanian isle of Saseno). Most of Dalmatia (with a small community of "surviving" Dalmatian Italians) remained not Italian, until WW2 - when the "Governorato di Dalmazia" was created for a few years. Another "assimilation" happened in the French border of the Alps, when the Nizzardo region (seen in the map to the left in light brown) was given to France in 1860 and after ten years, in 1870, happened the "Vespri Nizzardi" with the expulsion of more than 10000 autochthonous Italian speaking inhabitants of Nizza. Indeed, immediately after 1861, the French government closed all the Italian language newspapers (and the few Italian schools) in order to promote a complete "Frenchification" of the Nizzardo, while more than 11,000 Nizzardi Italians were forced to move to the Kingdom of Italy. The dimension of this exodus can be deducted by the fact that in the Savoy census of 1858, Nice had only 44,000 inhabitants. 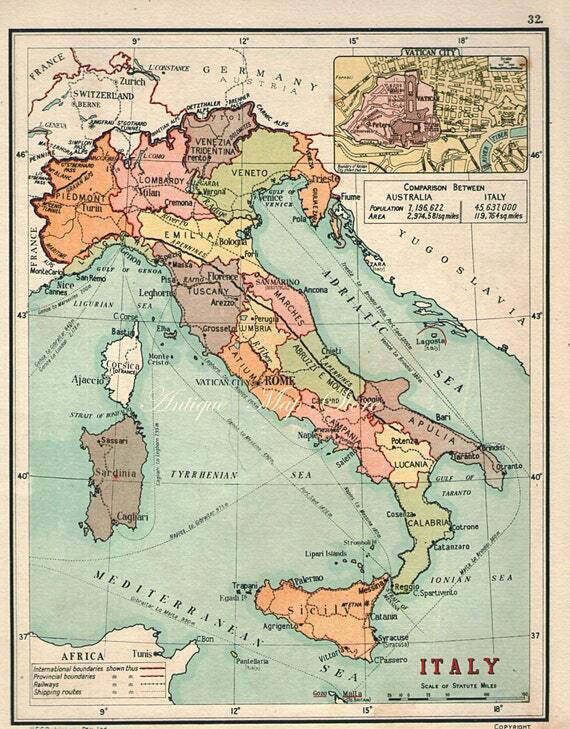 In 1881, The New York Times wrote, "Before the French annexation, the Niçois were quite as much Italian as the Genoese and their dialect was if anything, nearer the Tuscan, than is the harsh dialect of Genoa". 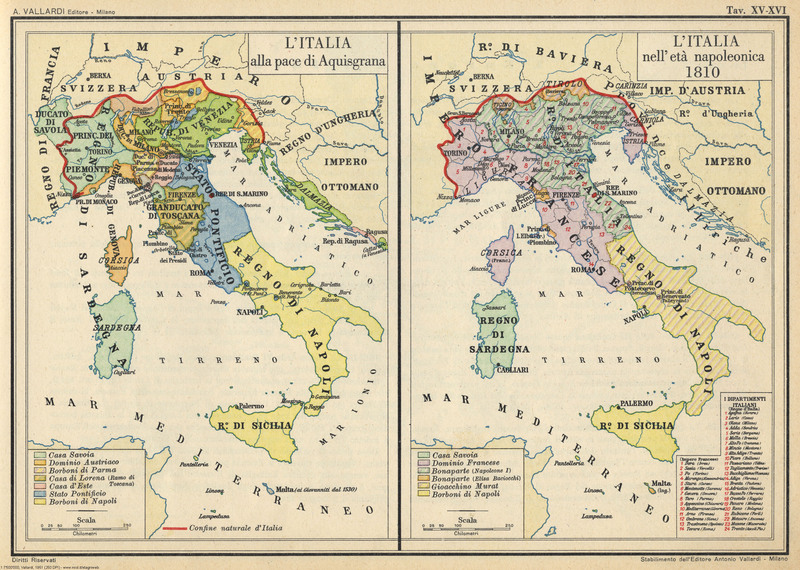 With WW1 all the borders of Italy wanted by the Italian irredentism were nearly fully achieved (as can be seen in the above map) and in 1920 only the islands of Malta and Corsica with the area of Nizza and Ticino were not united to the Kingdom of Italy. Also the northern islands of Dalmatia -Cherso & Lussino- were "redented" (meaning "returned to Italy"), together with the small enclave of Zara. Italian irredentism had the characteristic of being originally moderate, requesting only the return to Italy of the areas with Italian majority of population, but after World War I it became aggressive - under fascist influence - and claimed to the Kingdom of Italy even areas where Italians were minority or had been present only in the past. In the first case there were the Risorgimento claims on Trento, for example, while in the second there were the fascist claims on Corfu, Savoy and Malta. In 1922 Mussolini started a new era in Italian politics: he created in 1936 the "Impero italiano" and also promoted a new Italian irredentism. This fascist irredentism was promoting also the union to Italy of territories that were (or had been) only historically populated by Italian people and that were outside of the natural borders of Italy (as established since the "Italia Romana" of Augustus). 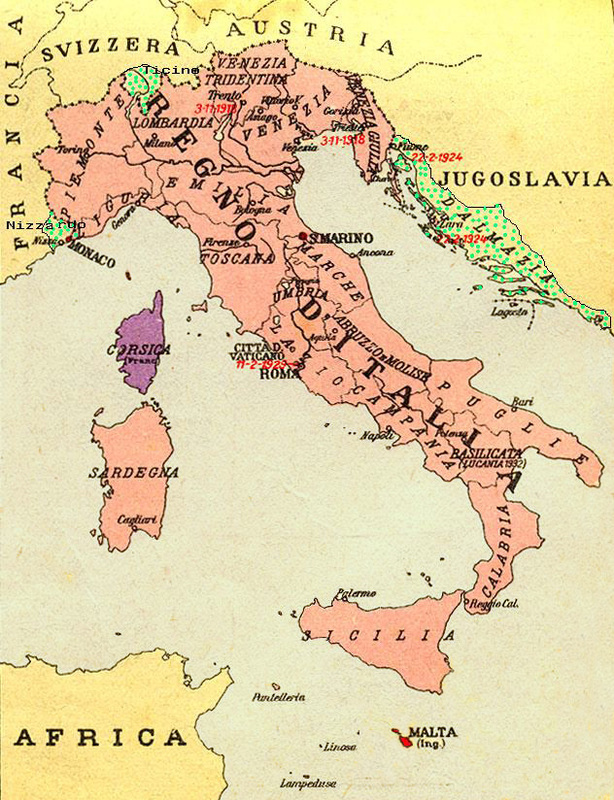 Mussolini (as can be seen in the map to the left) was able to enlarge in 1941 the borders of the Kingdom of Italy with the union of territories in Dalmatia and around the ancient-roman "Emona" (now called Lubiana). He also -after the initial Italian military occupation during WW2- proposed the creation of the provinces of Corsica, Nizza and Ragusa di Dalmazia (and the provinces of Malta and Ticino, if conquered). Additionally it is noteworthy to remember that Mussolini in 1939 created in Italian Libya the provinces of Tripoli, Misurata, Bengazi and Derna as part of the metropolitan territories of the Kingdom of Italy. In April of the same year he also occupied & united Albania to Italy under the crown of the King of Italy, creating some local Italo-albanian provinces (read: http://researchomnia.blogspot.com/2016/11/albanias-unification-to-italy-in-1939.html). All these provinces were planned to be united with the possible Italian future provinces in Corfu & Ionian islands and in Rodi & Dodecanese islands, after his "dreamed" victory in the war. 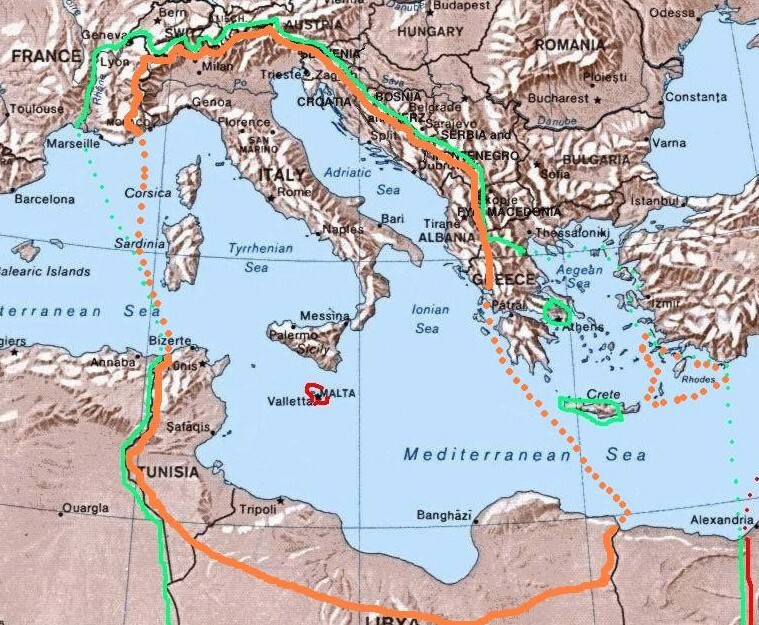 Indeed Mussolini wished to create the "Grande Italia" (Great Italy) from the Alps to the Libyan Sahara and to the Dodecanese islands), as shown in the left map with an orange line. Furthermore the historian Gilberto Oneto wrote that Mussolini wanted to unite Minorca -the easternmost of the Balearic islands- to this 'Grande Italia plan' and in early 1939 he made a request to Spanish dictator Franco about an Italian air base in Minorca (as compensation for the Italian help in the Spanish civil war), but he received a denial. However the defeat of Italy reduced in 1947 the Italian borders at the Peace Conference in Paris, with the loss of territories to Yugoslavia & France. In the change of Istria borders were discussed at the 1947 Peace conference many options, as can be seen in the following map, but the decision to use the "French line" cut out of Italy many Istrian Italians. 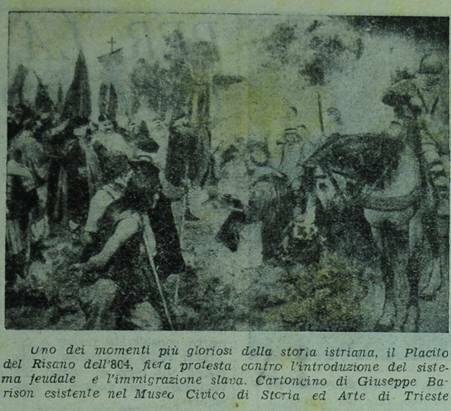 They were forced to do the sad "esodo istriano" (Istrian exodus): nearly 350000 Italians left in a few years the border areas assigned to communist Jugoslava, while depopulating areas of western Istria where the Istrian Italians always were more than 90 % of the population since Roman times. The last change in the borders of Italy happened during the Trieste return to Italy in 1954. Furthermore the "Territorio Libero di Trieste" (or TLT, created just after WW2) was officially dismembered with the "Osimo Treaty" in 1975. 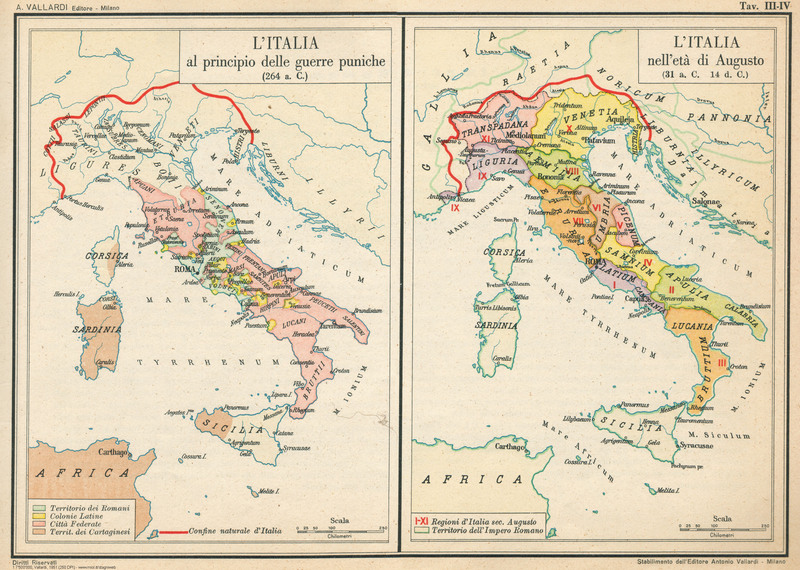 Actually the borders of Italy are similar -but not identical- to those of the "Italia" in Roman times (shown in the first map of this article): in the northern Alps the addition of Alto Adige balances the loss of Ticino, but still there it is no Corsica, Nizzardo, Istria and Malta. Finally we must pinpoint that Italy is no more only a geographical entity (as said Metternich in the 1800s), but also an historical & political reality. Very well written and with perfect detailed maps. I wonder if more maps about the Ionian islands with the Italian Dodecanese could be added, but I think it is OK the article as it is now.